I started in May purging 7 items per day for the month. I have challenged myself since then to purge 100-200 items per month. The first couple months I was closer to 200 items but most months I have done 100 items. I have been working on it a couple hours per week instead of every day. My current project which is 40 Bags in 40 Days started March 5th. I'm back to working on purging everyday again. 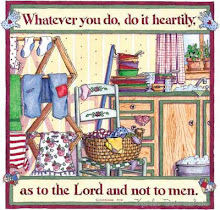 I’m cleaning, organizing, and purging my house during this season of Lent. I bought new shorts this weekend so out goes the old. My Dad's Clothes, a Rug, and Old Cards. Shirt, Magazines, and a Container. Paper that use to be in the Notebooks. Containers, Candles, Flower Pot, and Pie Plates.